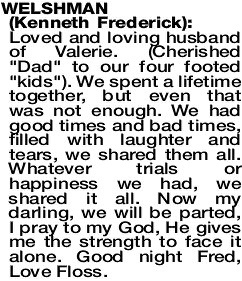 Loved and loving husband of Valerie. (Cherished "Dad" to our four footed "kids"). We spent a lifetime together, but even that was not enough. We had good times and bad times, filled with laughter and tears, we shared them all. Whatever trials or happiness we had, we shared it all. Now my darling, we will be parted, I pray to my God, He gives me the strength to face it alone. Good night Fred, Love Floss. 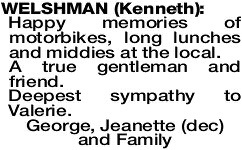 The Funeral Service to celebrate the Life of the late Mr Kenneth Welshman of Bertram formerly of Booragoon and York will be held in our Chapel, 506 Marmion St, Booragoon at 10.00am MONDAY morning (8.4.2019). No flowers by request. Donations in lieu to the Heart Foundation. 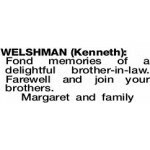 WELSHMAN KEN Loving memories of our cousin in law Ken. You will be sadly missed and we will remember you for your wit and humour. Love from Jenny, Marilyn, and families. Fond memories of a delightful brother-in-law. Farewell and join your brothers. 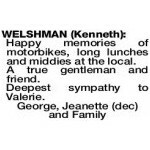 WELSHMAN KEN My Uncle, my Godfather, you will be very much missed. My thoughts and love to Aunty Val and our Welshman family. Forever Cheryl. Happy memories of motorbikes, long lunches and middies at the local. A true gentleman and friend. Deepest sympathy to Val. Many fond memories of dinner dances and welcome visits to York. A true gent. Linda and Paula. 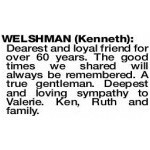 WELSHMAN KENNETH Dearest and loyal friend for over 60 years. The good times we shared will always be remembered. A true gentleman. Deepest and loving sympathy to Valerie. Ken, Ruth and family.